It’s hard to believe that only two seasons ago, the Ottawa Senators were just one goal away from the Stanley Cup Finals. Entering last season, hopes were high for the club after the deep playoff run. That hype was fueled when the team acquired Matt Duchene from the Colorado Avalanche, although it came at the cost of veteran Kyle Turris and both a first- and third-round pick in the 2019 NHL Entry Draft. The team didn’t execute, though. Captain Erik Karlsson was recovering from an offseason ankle surgery and wasn’t 100 per cent for most of the year. Losing Mark Borowiecki to a concussion and Chris Wideman to a torn hamstring depleted the defence corps. They ended up plummeting down the standings, finishing second-to-last in the NHL. Making things worse, the club’s goaltending duo of Craig Anderson and Mike Condon performed below average, ranking second-to-last in save percentage in the NHL. This season, the team’s core of Karlsson, Duchene and Mark Stone are all pending free agents. 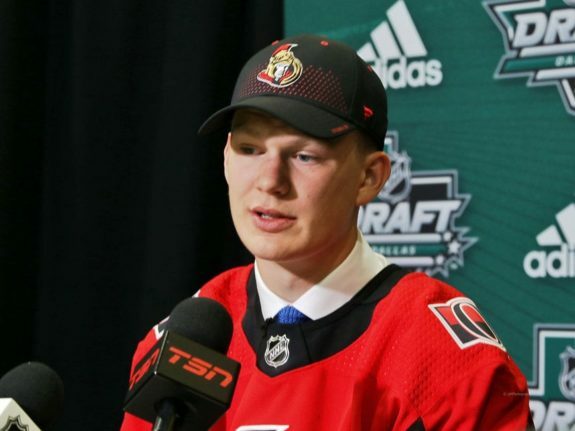 The group will also be seeing an influx of youth with numerous players looking to make the jump this year, including 2018 first-round pick Brady Tkachuk. With team owner Eugene Melnyk announcing his plans for a rebuild and a multi-year plan to get the organization back on track, this team is likely to see a large overhaul this season. There are many other questions heading into the season. 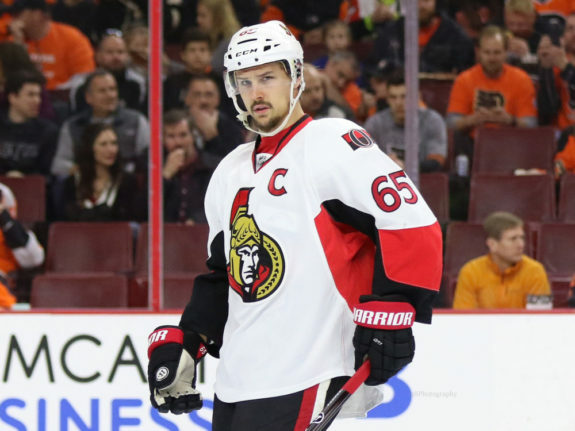 Will Erik Karlsson still be a Senator by the end of the season? Which young players will make the cut? Can Anderson and Condon bounce back? The biggest change in the Senators organization this summer was highly publicized. Assistant general manager (AGM) Randy Lee stepped down from his post. In May, Lee was arrested in Buffalo for allegedly harassing a teenager. Lee is accused of rubbing the shoulders of a 19-year-old male shuttle bus driver and making crude comments to him at the NHL combine in Buffalo. After being suspended by the organization in June, Lee resigned in August to be with his family and to focus on the court case, to which he has pleaded not guilty. Lee had been with the team since 1995 as a video coach, working his way up to the director of hockey operations in 2009 and then the AGM in the 2013-14 season. The organization has yet to fill Lee’s position of AGM and general manager of the team’s AHL affiliate in Belleville. On top of the numerous questions regarding personnel on the ice heading into the season, this is another unresolved issue that the team will need to solve as training camp approaches. 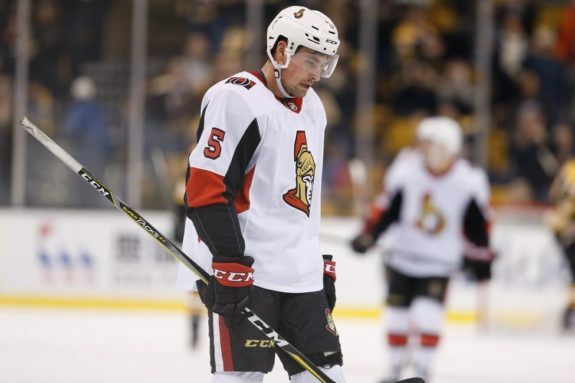 In less dramatic headlines, the Senators hired former player Chris Kelly as a development coach for the club. Kelly played for the club after being drafted by them 94th overall in the 1999 NHL Entry Draft. He went on to play 845 games in the NHL with Ottawa, the Anaheim Ducks and the Boston Bruins. Kelly comes to the team with a record of success, winning a Stanley Cup with Boston in 2011, a gold medal with Team Canada at the Spengler Cup in 2017 and captained Team Canada to a bronze medal at the 2018 Olympics. The club also hired three new scouts, as the team may look to rebuild in the very near future. Jean-Gabriel Pageau is about to take the jump to a leader on this team. The 25-year-old is entering his fourth full season on the team, playing parts of three seasons before that. Over 329 games with the Senators, Pageau has amassed 59 goals and 130 points. His best year came in 2015-16 with 19 goals and 43 points. With Pageau playing on a line with Brady Tkachuk or Mikkel Boedker, he may look to pass those totals this season. He went on to say that the team will have a chip on its shoulder this season. The Senators will be looking to prove the many critics wrong who believe they will be awful in 2018-19. Pageau will be a member of the group that will lead the charge to make the team successful while helping the prospects make the jump to the NHL. One of the newest members of the Senators, Mikkel Boedker will be attracting a comparison all year to the skates he’s filling. Acquired in the trade that sent Mike Hoffman to the San Jose Sharks, the Dane will likely disappoint if he’s being compared to Hoffman. Hoffman had over 50 points in each of the last three seasons, including one with 61 points in 2016-17. Boedker has only crossed the 50-point plateau once, back in 2013-14 when he had 51 points. He did finish last season with 37 points, but that was on a much better San Jose team. While he won’t be the team’s new Hoffman, the 28-year-old can be a great asset on the team. If Brady Tkachuk and/or Colin White can solidify themselves on the top two lines, Boedker will likely fit on the third. A 20-30-point player on a third line will be great for a team that finished 25th in the NHL in scoring last season. The other reason for Boedker being a positive addition to the team is his veteran leadership. The 2018-19 season will be his 12th in the NHL and with the influx of youth in the organization, just like Pageau, he will be a leader to the young players coming up to the big club. Along with Brady Tkachuk, Colin White will be leading the youth movement in Ottawa. With Melnyk’s announcement of a rebuild, this season will see the club start to hand the reins over to the younger players. White has already played with the big club, playing 23 games over the last two seasons, including 21 last year. White had found some chemistry with Duchene, with both players discussing how much they enjoy playing with the other. 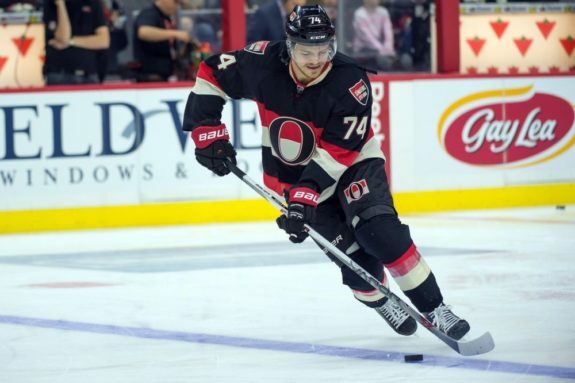 While Duchene and Mark Stone will likely be on the top line, it seems likely that Duchene and White may get the opportunity to build on their chemistry, especially if the Senators decide to put more faith in the young players coming up in the organization. While White only has six points with the Sens, he played as the captain at the rookie tournament and seemed like he was going to make the NHL club last season before breaking his wrist. As White looks to enter his first full season on the Ottawa roster, he should be a bright spot in what looks like a dark season in the nation’s capital. Much like Pageau, Mark Borowiecki is ready to be a leader and take over this team. 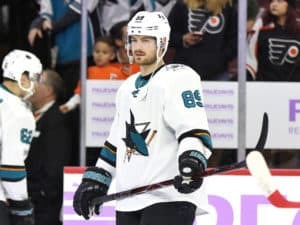 The shutdown defenseman spoke out in an interview recently about the state of the team, and how they need to move on. “There are certain things we can actively try and change as a group; if we are just going to sit here passively and say, ‘We need the culture to change,’ well, the culture doesn’t just change,” he said. “It changes because we have a group of guys that rally together and say, ‘This is the way it’s going to be done,’ that this is how we expect them to come in and handle their off-ice issues. The candid interview shows that Borowiecki isn’t content with another bottom of the NHL finish. The defender wants to be a part of turning the club around and getting them back on track. With him as a leader in the dressing room, the 29-year-old will look to lead the culture change in Ottawa and set up the culture for the youth movement coming up through the ranks. 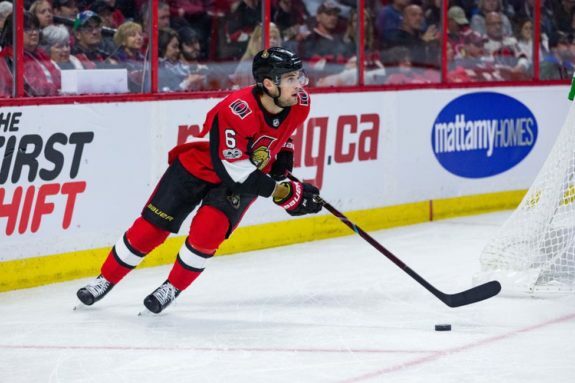 Chris Wideman played in only 16 games last year for the Senators before a hamstring injury that required surgery sidelined him for the year. Leading up to his injury, Wideman appeared ready to break out in his role as a puck-moving defenseman. Entering his fourth year with the club, what he hopes is a full, injury-free season, this could be the year that the St. Louis native comes into his own. He will likely be on the third line, perhaps seeing time on the second depending on how Ceci bounces back this year. If Karlsson ends up getting traded out of Ottawa, he will be a very prominent piece on the Senators’ back end. 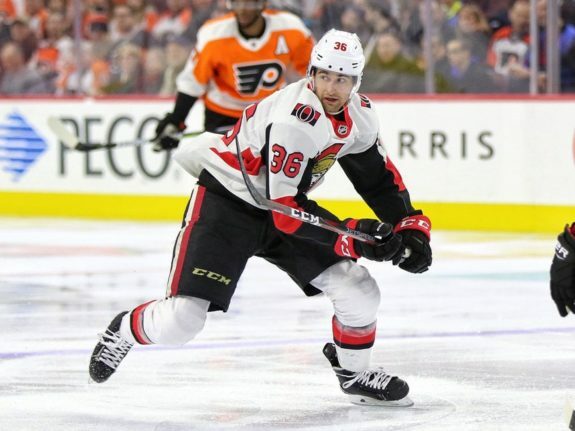 He has yet to put up big points in the NHL, but during his time with the AHL’s since-relocated Binghamton Senators, Wideman put up 51 and 61 points in his last two seasons there. If he moves up the depth chart, the Senators could see a big jump in Wideman’s point totals. If that is the case and Wideman surpasses his previous career-highs of six goals and 17 points, the Sens may come out winners here. Wideman re-signed with the Senators this offseason to a one-year, $1-million contract. This will be a make or break year for the defender, as the organization will need to see him improve if they decide to keep him in the organization for the long-haul. While it might have come from injuries, Christian Wolanin was called up for his first 10 NHL games last season. This season, he will look to become a fixture on the back-end for the club. 10 games is a small sample size, but the defender collected a goal and two assists and showed flashes of what is to come. More impressive, his Corsi-for was 53.63 per cent, the best of any Senator defender. While this would likely lower over a full season, it’s very promising for the club. The 23-year-old isn’t guaranteed anything though. If Karlsson is traded away, his spot on the lineup is much more likely. If he remains, he’ll have to fight for it. 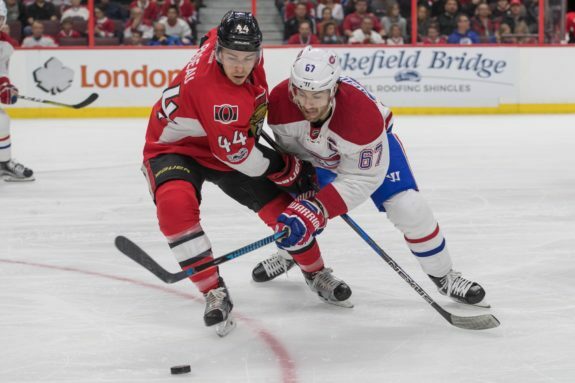 Troy Mann, the incoming coach of the Belleville Senators and coach for the rookie tournament, had nothing but praise for the young defender and has faith in him sticking in the NHL. If Wolanin makes the cut come October, the offensive defenseman will likely see time on the powerplay. During his three years at the University of North Dakota, he put up 72 points over 109 games. That kind of production could be just what the defence corps needs both at even-strength and on the powerplay unit behind Karlsson and Chabot. The goaltending in the 2017-18 season was less than ideal for the Senators. Craig Anderson went 28-25-6 with a save percentage (SV%) of .898 and a goals-against average (GAA) of 3.32. Mike Condon wasn’t any more helpful, going 5-17-5 with a .902 SV% and 3.25 GAA. Not exactly what you need from either your starter or your backup. Anderson is entering the first year of a two-year deal worth $9.5 million, which is likely why the team couldn’t move him this summer. For now, Anderson is still a member of the Senators and will need to bounce back this year if the team is going to have any chance in improving on last season. The team’s starting goalie has career averages of 2.76 GAA and a .914 SV%, and this past season’s numbers were some of the worst in his career. 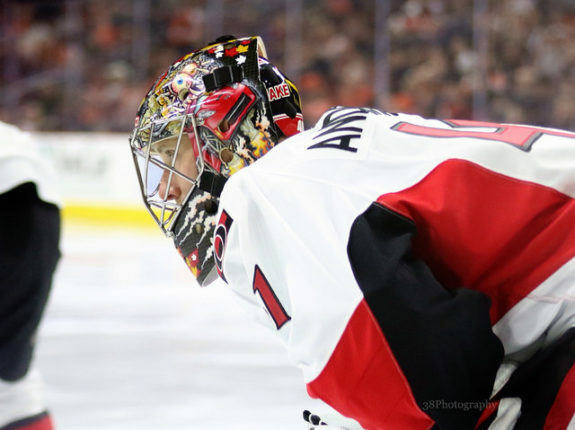 Ottawa is hoping that this was just a down year for Anderson and that he regains form in 2018-19, rather than their goalie of the last eight years starting to show his age. The goalie situation is one of the question marks as the season moves forward. For now, there’s no mistaking that Anderson is the starting goaltender. His contract may be hard to move at the high cap-hit and due to his age, but the Senators will likely still be looking to move Anderson if the season is lost and they find a willing partner. In 2017-18, Thomas Chabot was one of few bright spots on what was a season to forget in Ottawa. The 21-year-old came in for his rookie season and put up 25 points in 63 games, ending up playing on the top line with Karlsson. 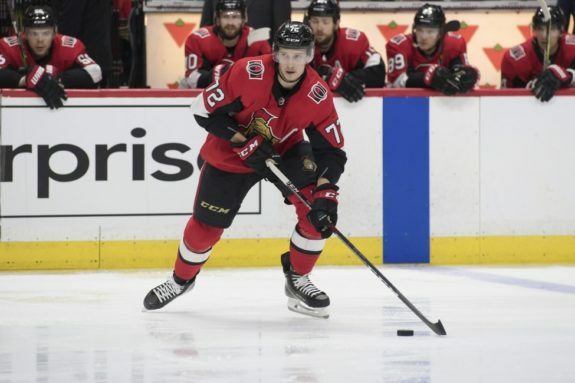 Whether Karlsson remains on the team or not, Chabot will be the Senators biggest breakout player in 2018-19. With Karlsson on the team, Chabot is the number-two defenseman. He’ll play top-line minutes and be a fixture on the powerplay. In his sophomore season, it’s not hard to see the young player cross the 40-point mark. If Karlsson is traded, the 18th overall pick in 2015 instantly becomes the club’s top defender and will be forced to step his game up. Another year with Karlsson would do wonders for Chabot’s career, but if the team moves him, the young defenseman will take over the team’s end zone. Cody Ceci is entering his sixth season with the Senators, after being the 15th overall pick in the 2012 NHL Draft. He was homegrown, being born and raised in Ottawa, even playing four years with the Ottawa 67’s. He has yet to really live up to the hype that surrounded him when he was selected six years ago. That was no different this past season. Playing all 82 games, Ceci collected only five goals and 19 points. His career high came back in 2015-16 with 10 goals and 26 points. He has yet to really find his offensive stride. While Chabot should take over the offensive aspect if Karlsson is traded, Ceci will need to help make up that difference as well, likely moving to the top line with Chabot. Ceci has become the target for many fans’ anger after last season. He hasn’t been the offensive force that many thought he would and his defensive game hasn’t been where it needs to be – he was on the ice for a league-leading 121 goals against last season. The defender will get a chance this season to prove himself to the organization. A restricted free agent this summer, Ceci and the Senators went to arbitration. The deal ended up being a one-year, $4.3-million contract. While he is a workhorse, averaging 23:20 minutes last season, the rest of his numbers aren’t where they need to be. This will be a make or break year for Cody Ceci, as he works to prove that the $4.3 million he was awarded is money well spent. The team will likely start the season with Tkachuk, White, Wolanin and Logan Brown in the lineup. After that, the Senators are lucky enough to have a great number of young talent that they can call up. If the season goes how most believe, with the team falling to the bottom of the standings and possibly parting ways with Karlsson, Duchene and others, then the 2018-19 season should see a great number of prospects get the call this season. White, Wolanin and Brown have already shown that they can keep up in the NHL, and should start the season on the club. As for Tkachuk, he made the choice to sign with the Senators this summer after being drafted fourth overall in June. He will likely play at least the nine games he can play without burning a year of his rookie contract and then the organization will decide what’s best. If he’s anything like his brother Matthew, who made the jump full-time to the NHL his first year, expect the young player to stick with the team. After those four players, Alex Formenton is the next forward who could see big league time. The 47th pick in the 2017 NHL Entry Draft, Formenton had 48 points in as many games last season for the London Knights. He also helped Canada to a gold medal at the 2018 World Junior Championship (WJC), collecting four points in seven games. The Barrie native could even prove himself in training and fight for a spot on the Senators opening roster. Another forward who could be called up is Drake Batherson. Through 122 games over four years in the QMJHL with the Cape Breton Screaming Eagles and the Blainville-Boisbriand Armada last season, Batherson has 137 points. Add 45 points in 33 playoff games and that looks like the Senators have an offensive threat coming up through the ranks. The 20-year-old played on Team Canada with Formenton for the 2018 WJC, scoring seven goals in the seven games. Both Formenton and Batherson, along with Tkachuk, impressed at the NHL Rookie Showdown games versus the Montreal Canadiens and the Toronto Maple Leafs on Sept. 7 and 8, winning both games. The Showdown showed a lot of promise for the young players. As for defence, Christian Jaros will likely be the first defender the team will call-up this season if needed. He has already seen NHL action, playing in two games in 2017-18. While not an offensive threat, Jaros projects to be a solid stay-at-home defenseman that should compliment Chabot and Wolanin in the years to come for the team. Finally, goalie Filip Gustavsson looks to be the goaltender of the future for the Senators. The 55th overall pick in the 2015 draft by the Pittsburgh Penguins, Gustavsson was traded to Ottawa in February as a part of the Derick Brassard trade. The Swedish netminder will start the season in Belleville and probably won’t see NHL time this season, as he still needs some time to develop. The Senators currently have 11 players under contract for the 2019-20 season. Erik Karlsson, Mark Stone, Matt Duchene and Chris Wideman will all become unrestricted free agents. Colin White, Cody Ceci and Christian Wolanin will become restricted free agents. What happens during this season will set the course for the future of the team and according to Melnyk, it looks like this may be the last season in Ottawa for many of the team veterans. The most pressing issue is what will happen with Karlsson. Whether he is traded or re-signs, management needs to sort out the future of their captain so it isn’t weighing over the team for another year. After Karlsson’s fate has been decided, the rest of the pieces should fall into place. 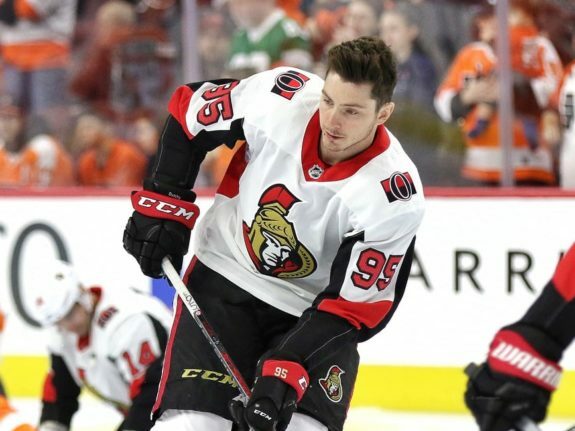 Duchene has publicly said that he’ll wait to see what happens with Karlsson and Stone before deciding on his future, but he is intrigued by free agency after watching Tavares test the waters this summer. While the contracts and futures of a large portion of the team will be talking points for the season, the on-ice play definitely will be too. The Senators are projected by many to be bad this year. After falling apart last season, one season removed from a deep playoff run, it’s not looking good in Ottawa for the coming season. Losing key players like Clarke MacArthur, Marc Methot and Johnny Oduya after the playoff run certainly didn’t help and the team was never really able to replace them. This season, those players are still not replaced after a quiet offseason and now Mike Hoffman is gone as well. As discussed, Mikkel Boedker is no Hoffman. Craig Anderson didn’t get any younger this summer either. If his play doesn’t improve drastically this season it will be a very tough year for the team. As bad as it may get, there are numerous players that the team can be optimistic about. Chabot, Tkachuk, White, Brown and the rest of the young players are starting the youth movement in Ottawa. It takes time, but there are some very good pieces coming up through the system for the Sens. The Senators will need to acquire a first-round pick though, after trading their’s to Colorado in the Duchene trade (What a time to start a rebuild, with another team having the pick that could take potential franchise player Jack Hughes). All of that being said, the team could shock the hockey world this year. Look no further than last year with the Vegas Golden Knights, making the Stanley Cup Final in their inaugural season. The beauty of hockey is that you never know. The team currently has elite talent in Karlsson, Stone, Duchene and has some excellent young players. If Bobby Ryan can find his game, Anderson bounces back and everything falls into place, the team could surprise. Duchene said it best when discussing the upcoming season. However, all signs point to that not being the case in the nation’s capital. There are too many questions around the team that have been left unanswered this offseason, and problems that have yet to be fixed. The young players on the team show promise for the future, but Senators fans should brace themselves for another tough year in Ottawa.